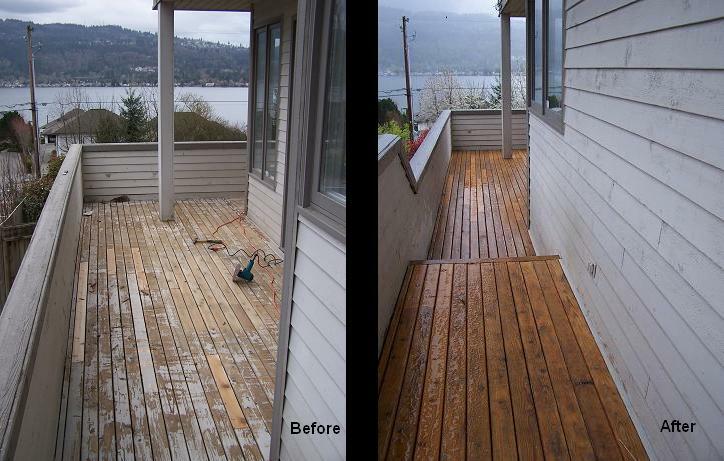 Our deck treatment process goes beyond power washing and staining. We restore most surfaces to like-new condition and produce a finish that can battle our wet climate, and look great too! We start by soaking all surfaces with our two-part deck cleaner and brightener, designed to balance PH, remove mildew, algae, and previous transparent finishes. This product is allowed to penetrate into the surface and activate for about 5 minutes, per manufacturer recommendation. This treatment is then followed by power washing to produce a clean surface, ready for sanding. After allowing sufficient drying time, we return to power sand all surfaces using our specialized Makita power disk sanders. 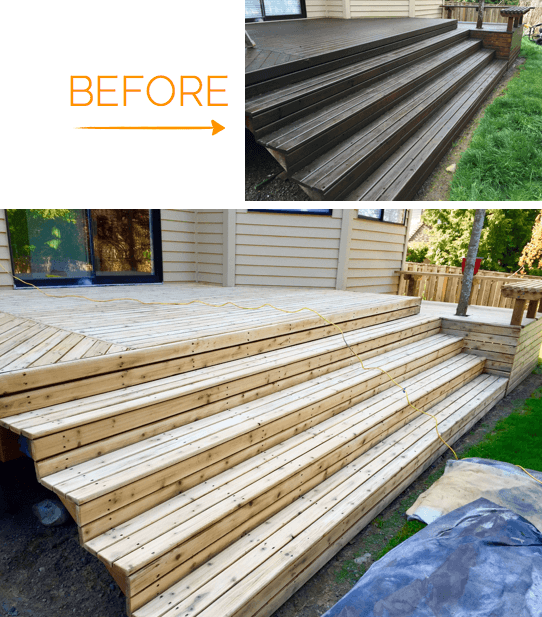 This process restores most deck boards to 90% like new condition. spindles are hand sanded to prevent damage, and remove any splinters or cedar pores that may have been raised by the pressure washer. Once all the sanding dust has been removed from the deck and surrounding surfaces, we apply two coats (wet on wet) of TWP natural cedar tone stain. Per manufacturer’s recommendation, the second coat of this material must be applied within minutes of the first coat, and the access removed. Depending on the size of the deck, we may spray or simply brush the stain on. If a sprayer is used, the material is back-brushed to ensure proper penetration and removal of excess stain. 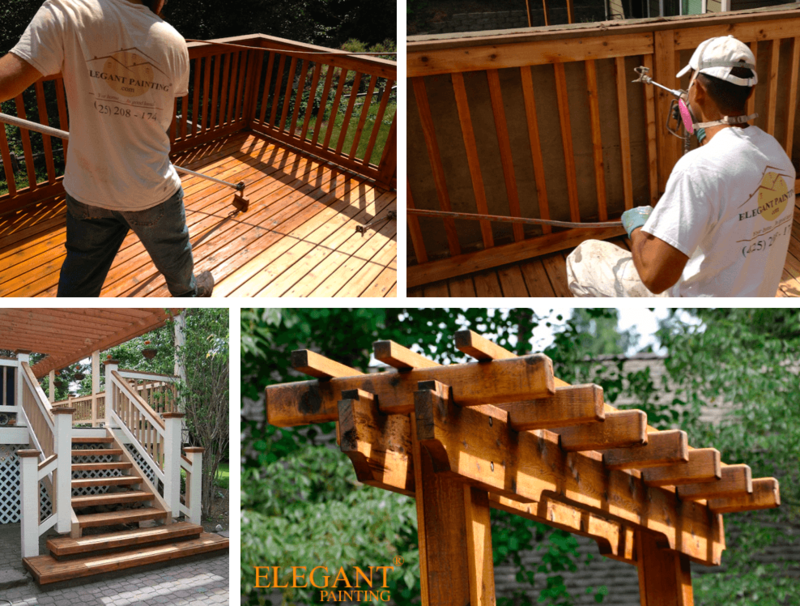 See more images of decks we have refinished with the TWP 101 natural Cedar tone stain. How long should we stay off our deck? Patio furniture and BBQ: 4 days. Foot traffic (people and dogs): 2 days. Cats: 12 hours. Rain: OK to get wet within 1 hour of stain application. Should we have the underside done? Commonly the underside of your deck needs to be treated every 10-15 years. What if our deck is currently painted, or treated with solid-color stain? We can either re-stain using a Benjamin Moore solid stain, or remove the previous finish, and apply our natural cedar tone semi-transparent material. Care to tackle this project yourself? 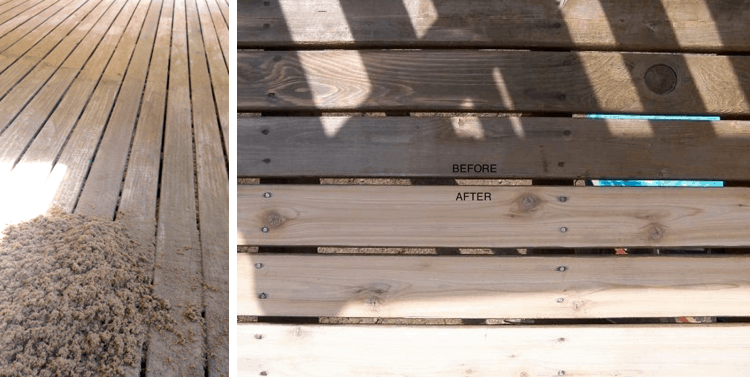 View our do-it-yourself Deck Refinishing blog.